Near death experience (NDE) is a phenomenon that has been reported from the teachings of ancient Tibet to the medical journals of the modern West. In near death experience, the body undergoes some crisis or trauma that brings it to the very brink of death. The heart may stop, independent breathing may cease and, in rare cases, brain activity may cease altogether for a brief period. During this time, those experiencing near death feel themselves float out of their body. They may spend some time near their physical shells, observing people and events with a detached curiosity. 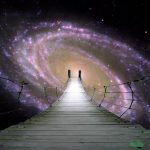 Many individuals who report such an out of body experience in connection with an NDE are often able to give accurate descriptions of individuals and procedures that they would have had no other way to observe. Out of body experience can happen independent of NDE. What makes NDEs special—and remarkable—is that the individual's experience does not stop there. The near death experiencer seems to travel beyond the world of the living to an entirely different realm. Many people believe that this is the realm of spirits or an in-between realm that functions as a kind of way-station for spirits before they move on to another portion of the afterlife. Virtually all who experience near death report seeing a brilliant white light, and this often seems as if it is shining at the end of a tunnel. The experiencer is drawn toward this light. Some attribute an intelligence to this light, while others perceive the presence of a benevolent guide assisting them in their journey. The faces and names attributed to these higher beings will vary according to the individual's own cultural and religious background. Many others report being greeted by deceased friends and family members, especially parents and spouses who have gone before. True death may be the next stage of transition once the individual follows the light to its source. However, near death experiences are part of the paranormal canon not because the individual dies, but because they come back to tell of these strange visions. The subtle body or point of consciousness that is projected during this experience reintegrates with the physical body, often having been turned away from the light by a higher force informing the individual that it is not their time. When reintegration occurs, all bodily functions resume as normal and the individual returns to life. People who undergo a near death experience almost universally come back changed. Nearly all lose their fear of death, and this is reflected in a new appreciation for life. Those who have a near death experience are also more serene in the face of obstacles, seeing difficulties in life no longer as tragedies but as tests or learning experiences. In addition to developing a new and positive attitude toward life and living, many return with previously undemonstrated psychic abilities. They may become empathic or telepathic. They may get visions of the future. Others may return with the ability to heal themselves and others with the power of thought alone. All of these newly awakened sensitivities often lead the experiencer to develop a more spiritual attitude, deepening their convictions in their previous religion or leading them to develop a new, more universally accepting spiritual path. The transformational qualities of a near death experience are somewhat humorously demonstrated by the case of Natasha, a five-year-old black macaque housed at an Israeli zoo. After nearly dying from a severe case of stomach flu in the summer of 2004, Natasha began to walk upright exclusively, mimicking humans. Aside from speculating on possible brain damage, Natasha's handlers had no good explanation for the monkey's change in behavior after her brush with death. If Near Death Experience can be so empowering and beneficial, how can we harness it without trauma or risk? A number of mystical techniques practiced in ancient times and in foreign lands have historically sought to bridge the gap between the living and the dead. These techniques allow the diligent practitioner to undergo a controlled NDE through the medium of a ritual death and rebirth, thus enabling them to achieve all the benefits of the experience and become a walker-between-worlds. In shamanism, Tibetan Buddhism, and a surprisingly wide number of ancient traditions, near death experience was not just something that happened accidentally. Through trance, meditation, and other techniques, NDEs were actively sought out for their transformational qualities. In shamanism, near death experience was an initiatory technique that opened the fledgling shaman to new powers and a new way of looking at both life and death. In Tibetan Buddhism, meditations that allowed the student to essentially practice dying endowed the individual with a great ability to harness the transition of actual physical death, using this to launch the spirit into higher states of being. Some of the many benefits of harnessing these near death states involved a greater sense of peace about life, a loss of the fear of death, and a profoundly improved ability to communicate with the world of spirits. The death and rebirth inherent in an NDE helped the experiencer to achieve a very special state of balance between life and death. The problem with the system outlined in the Tibetan Book of the Dead, as well as with the many varieties of shamanic practices from around the world, is one of accessibility. Growing up here in the West, most of these techniques seem strange, foreign, and out of reach to us. When they are explained in written works, they are often couched in obscure terminology, shrouded in metaphor, or simply lost in translation. A further problem is one of context. The modern world in which we now reside is radically different from the world of a Tibetan lama or an aboriginal shaman. Our daily experiences and our cultural perspective often make it hard to relate to the lessons and exercises taught in these other systems. Although death and the transformative potential it carries are certainly universal, the language through which these experiences are often conveyed is not. The answer to this quandary, of course, is to find our own language, and to discover out own relevance. Some Western practitioners are certainly going to be able to pick up the Tibetan Book of the Dead and apply its teachings directly to their own lives. But, for the rest of us, a kind of literary alchemy has to occur, bonding the ancient wisdom with symbols and experiences that are meaningful to our present-day lives. In my book, Walking the Twilight Path, I attempt to enact just such a transmutation. Drawing upon the insights and wisdom of ancient cultures from Egypt to Tibet, I fuse these with the modern Gothic aesthetic, updating terms and experiences to make them meaningful and relevant to people living in this modern world. The result is a system that stares unblinkingly at death, seeking to see both its elegance and its necessity. It embraces a balance between the energies of life and death, and it reaches across the Veil to facilitate powerful interactions between the living and the dead. Walking the Twilight Path seeks to round our little lives, not with a sleep, but with a profound revelation. Life and Death are two sides of the same vast gate, and both of these profound experiences will yield up their mysteries to those who possess the courage to approach that eternal threshold. Article originally published in The Llewellyn Journal. Copyright Llewellyn Worldwide, 2008. All rights reserved.